A man accused of killing a 63-year-old woman at their workplace in Mira Mesa earlier this month was charged with murder Wednesday. Arraignment, however, was put off until Friday for Leopoldo Pacuan because a Tagalog interpreter was unavailable. 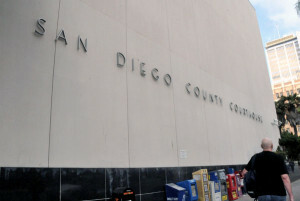 Pacuan, 48, was arrested at his San Diego residence last Thursday in connection with the May 18 death of Raquel Morales, according to San Diego police Acting Lt. Manuel Del Toro. Police did not immediately release a suspected motive or say what, if any, relationship Pacuan had with Morales. But Ryan Alacon, the victim’s nephew, said the defendant worked with his aunt, though their exact relationship wasn’t clear. Alacon said his family had a message for Pacuan. Officers found Morales at the LBC Express business office in the 8900 block of Mira Mesa Boulevard just before 2 a.m. May 18, after her husband called police and asked someone to check on his wife because she had failed to return home from work as usual. Her body sustained “obvious trauma,” Del Toro said. LBC Express is a cargo and courier service.